Hi all, yayw was a great source of ideas when I first started planning so thought would share my day with you all! I'm not really going to say much about before the day but just lots of photos because they are clearly the best bit! So briefly, we met online Jan 2010 and knew fairly soon that we wanted to get married! We got engaged Jan 2011 and married on 31st March 2012. I loved every moment of getting engaged and wedding plans...right up until my dress was due, then delayed and then too small! Many alterations took place and althogh I love my dress I was never happy with the back so you will not see any pictures of that I am afraid it was banned!SO the week before was beautiful, glorious sunshine every day and we were so excited. But of course on the Saturday it was cloudy and cold...never mind just a bit of a shame as meant we didn't get as many photos as I would have liked. I would recommend others persist and not worry about being coming out in the cold. Get the photos you want! You will only reget it otherwise and there is nothing worse! So lets get started! Here is Tim getting ready putting on the watch I bought him as a a pressie. It was a total surprise and when I spoke to him in the morning he really did have no clue which was fab. As you can see from his face he was happy! 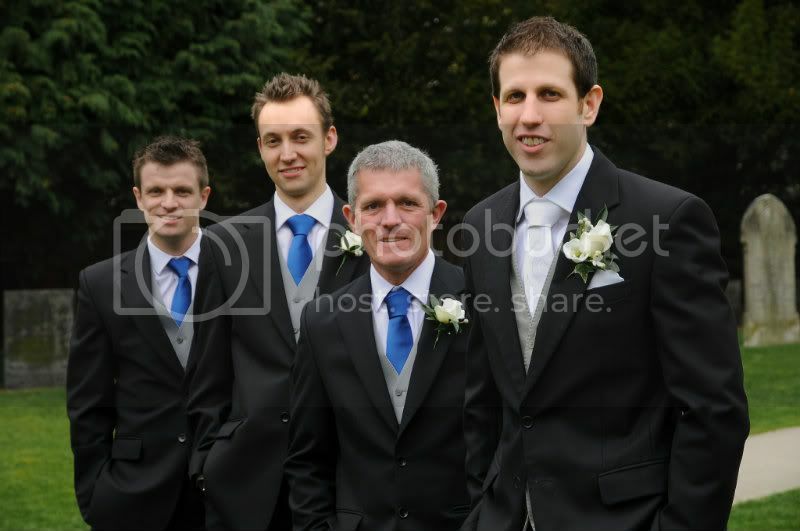 Here is him and his best men and usher before the service.. 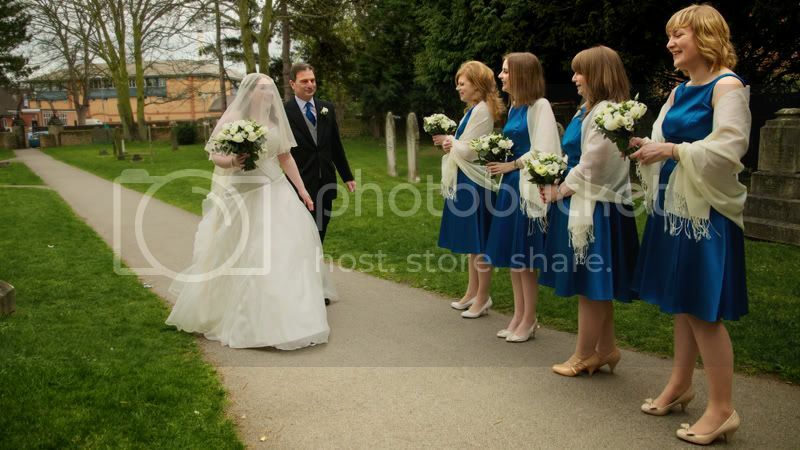 I started putting on my dress with over an hour to go but it was still a rushfor bridesmaids to go in car on time as it was doing 3 trips...anyway I ended up being late because of this I practically ran up the church path! So onto the service! This was by far the best part of the day! Everyone who played a part was superb and we just thoroughly enjoyed every min of it! I was smiling from the moment I walked into the church until much later! Here are some photos! We had a fantastic band made up of people from Tim's old church and our current one which worked brilliantly! My friends daughter was also waiting and looked gorgeous, was so excited when I let her hold my bouquet! Our weddng party of bridesmaids, best men and usher. Just love the colour of the bridesmaids dresses although they did need the pasminas! My favourite confetti shot, just love the happiness on guests faces! Anyway after tea and cake and a bit of time to chat in the church was back into the car on the way to the reception! Was really lovely to have time with friends whilst enjoying a welcome drink of eldeflower and champagne with canapes! I really enjoyed the relaxed atmosphere and to be surrounded by all our friends and family! Then we snuck out for some time to ourselves and some photos in the gardens! If it had been sunny would have had loads more photos in the beautiful grounds but just wasn't meant to be! This one helps me fall in love with my dress a bit more! It was grass stained by this point but I really didn't mind! We had done a lot of setting up the day before alongside the caterers and I was so happy with how the room looked! We DIYed all the flowers and sorted everything else as well! Mini egg favours went down very well! Our beautiful cake made by a friend and my teddy that my Dad bought and featured in the speeches! After dinner and speeches it was time for the first dance! We had a fab live band who played through most of the eve with an ipod used inbetween! we stayed on the dance floor for a fair while after which was great. 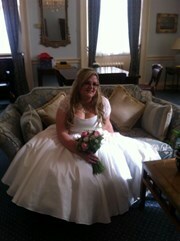 I have to admit though by 9.30 I was shattered and tiredness set in! Was great to be able to relax in the 'sofa room' and upstairs with the buffet to sit down and talk to people. We left at 11 to go to a hotel in the centre of town as venue didn't have any rooms. Was lvoely as friends of ours drove us and gave us a little hamper when we got there which had a slice of each wedding cake (fruit, chcolate, lemon and vanilla!) and some champagne and chocolates! So sweet! Anyone one last photo to leave you with! Lovely photos - you look so adorable beaming away in every shot! Bridesmaids dresses are gorgeous too and love that the car matches the colour scheme. Gorgeous! I love that there was blossom in the trees and on the ground! I was tempted by an earlier wedding for this reason! Lovely report and beautiful photos! Aww you all look lovely! Yes wore tiara after the service and very comfy forgot it was there! Although look in a mirror when you put it in....I didn't silly me!